WMSPanel provides excellent reporting for media servers - this is one of the major reasons for our customer to like our services. We've been continuously improving the statistics feature set and today we'd like to announce new reporting framework. We call it in-depth statistics reporting, or simply deep stats. each individual file if you make video on demand. You may enable this reporting for any slice in your account. Every stream or file has its daily statistics for the a dates' range. Maximum range is defined per data slice. Basically those are all stats which you see in daily statistics for any data slice. Time and duration ranges table. Later on we'll introduce peak bandwidth, unique users count, geo-location and ISP networks. Since a streaming media company may handle hundreds of live streams and thousands of files, there is a need for an easy way to pick up required data. Deep stats allows filtering data by dates range and the names of the streams and files. You may use regular expressions for specifying names of streams and files which you'd like to review. First of all you can leave blank search field to get the list of all streams. To get individual file or stream stats, just enter its full name. To make more sophisticated searches, use regular expressions. Check this website for regexp syntax. For example if you need to view stats for your "livetv" channel, you may simply enter "livetv" into search field. If you need to get stats for all MP4 files in your library, just search for ".*\.mp4". If there are streams which have names like "stream1", "stream2" ... "stream23" etc, you can enter "stream\d+" to cover name containing "stream" and some numbers. Sorting allows getting streams with most and least amount of views, traffic, average and total view time. Getting top connections count for one of applications. Getting total numbers for selected applications. 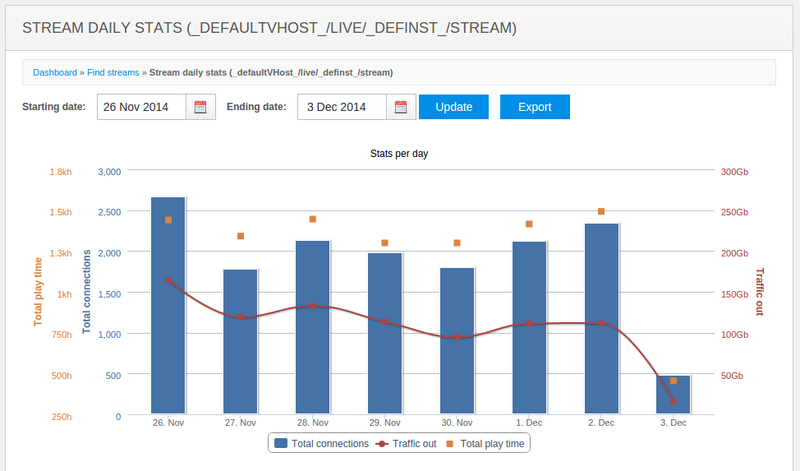 Example for VOD stats reporting. Viewing VOD files with top traffic. Reporting live shows with most view time. Reporting live show with best average view time. This reporting framework handles hundreds of thousands streams. WMSPanel processes and stores large amounts of data so it needs extra expenses. This is why this feature requires extra subscription upgrade. Unused records are not passed over to next billing period. These simple rules allow predicting possible pricing for the feature. You may also check package status via admin UI any time. You can figure it out via simple math. If you have 500 files in one data slice and 700 files in another one and you store statistics for last 50 days, it would be (500+700)*50 = 60,000 records. 60K records cost 50 USD per month. If you have 1500 files in 1 full default data slice stored for last 90 days this would be 135K records. The price would be 100 USD per month. The described data may also be obtained via pull API. The described feature set gives flexibility for reporting of your streaming assets. Going forward we are going to introduce pull API for secure access to your statistics and integrating it with your assets management system. Other improvements include peak bandwidth metric, user's geo-location and unique users. You may contact us if you'd like to enable this feature set to try it in action or if you have any further feedback about it. Please read this digest web page for more details about WMSPanel media servers reporting.